My favorite room changes from season to season. In autumn, I enjoy hanging out in the kitchen and trying new recipes (the very basic kinds!). You'll find me chilling on the sofa in front of the TV when the weather is frigid outside. In spring, I'm too busy digging in garden so I guess you can call that my favorite "room." And during summer when I have the most free time, I love to catch up on all my readings in the library. There are a total of 6 built-in bookcases, which I designed to blend in with the original architecture and moldings of the house. I also incorporated 3 antique iron sconces from my shop, TONE ON TONE. Additionally, I had the floors reinforced under the built-ins due to the weight of the books. The library used to be the dining room. When we renovated our 1918 home, I decided to convert it to our new library. Now the library is more of an interior room without direct, harsh sunlight - perfect for keeping books! Because it is off the front entry, and leads into the living room to the right and new dining room to the left, the space is very conducive for "gathering" during events. When we host a party, the club chairs are replaced with a center table with drinks and hors d'oeuvres. Also, it is an additional dining area for large family meals during the holidays. For a Christmas party, the entire house was decorated in a white winter theme. 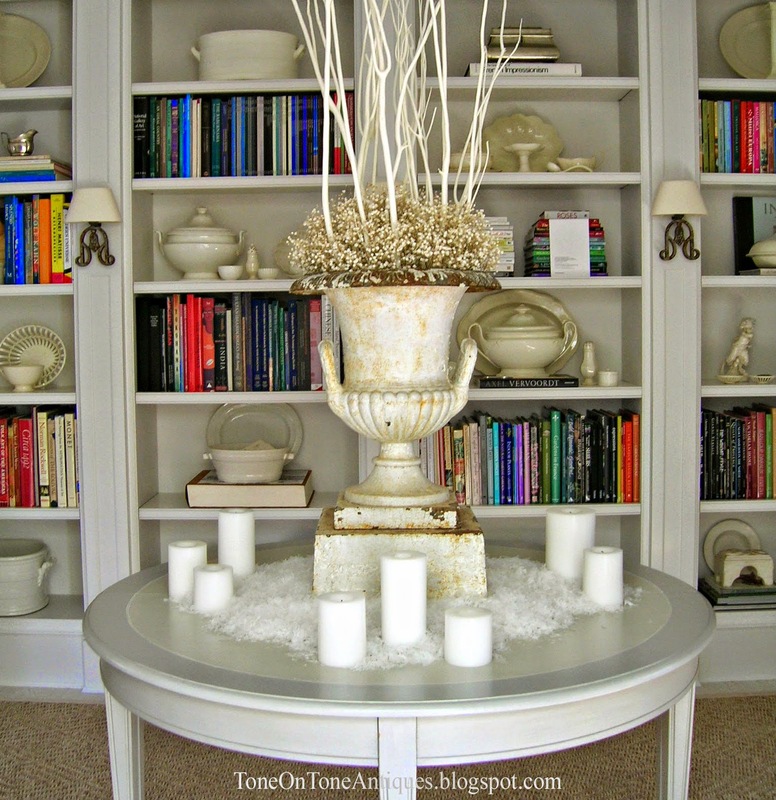 I filled the antique urn with white branches and dusted faux snow under the white candle pillars. It was magical when all the lights were dimmed and candles were illuminated! 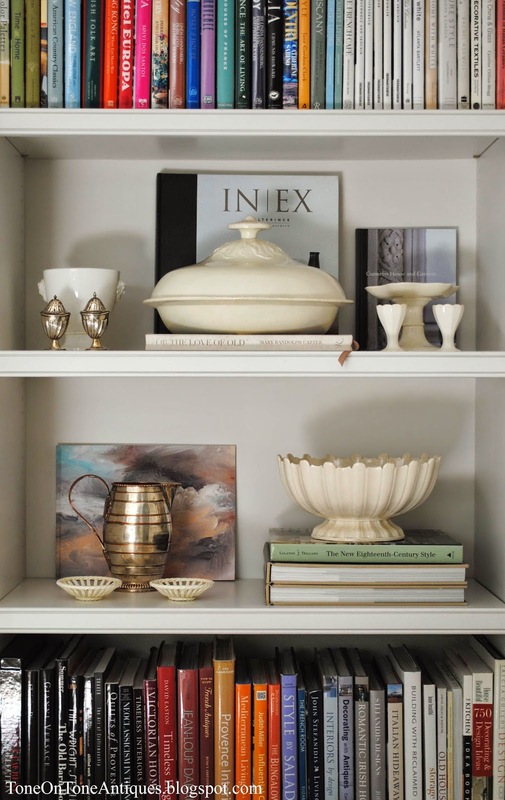 In addition to books, some of our antique creamware dishes are stored here. Since this used to be the former dining room and storage space is sooooo limited in an old house, I think it makes sense. Plus, it creates a visual break for all the books. And it is so handy to grab a platter to use in the adjacent dining room. Loi, this room is just beautiful and of course styled impeccably. Thanks so much for sharing it here with us. I sure hope I do get to meet you next time I am in the DC area. If y'all don't know Loi at Tone On Tone please get comfy, grab a drink and snack and check out more of his beautiful homes and style. If you have missed any of the past favorite rooms you can catch up here. Loi's home takes my breath away!! Just gorgeous...an understatement. Next time you're up here, Kim, a visit to his shop must be on the to do list. Any room in Loi's serene home would be a magical room to enjoy. I find his lovely photos are always emotionally moving through his Photo essay and his descriptions. 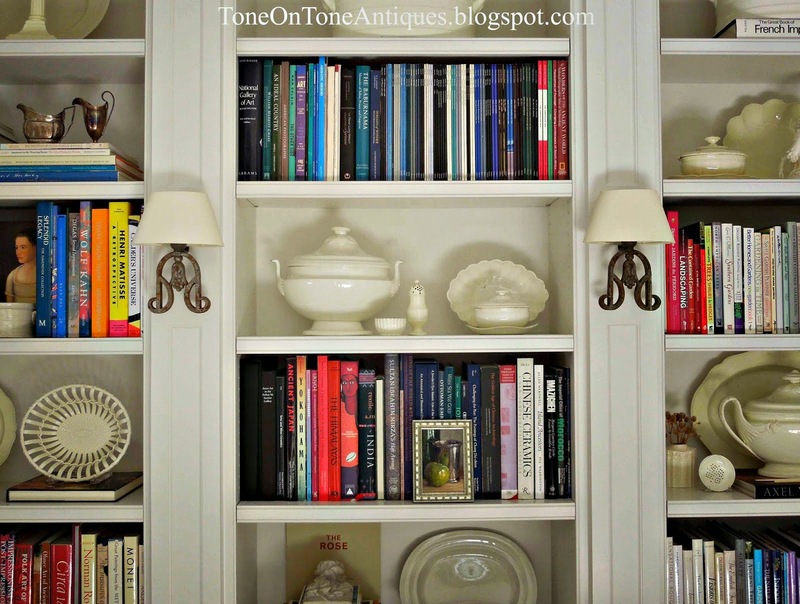 Oh how I love Loi's home...such a great idea turning the dining room into a library...Forgot he had a fabulous shop...I am amazed over the exquisite items and details! 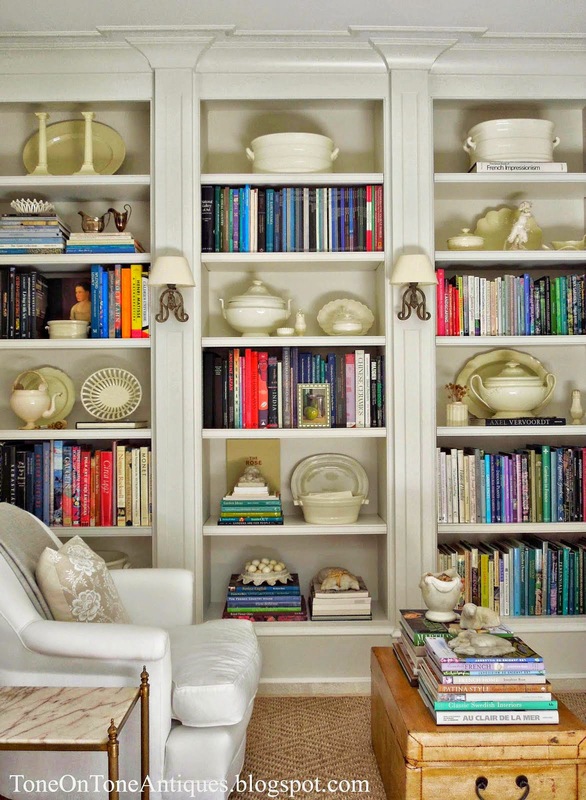 When the current 'fad' seems to be putting anything and everything on bookshelves except books, it's refreshing to actually see bookshelves used for their original purpose. What a wonderful space. I love that you have shown a library doesn't have to be huge to be beautiful and functional. Thank you for sharing such a lovely space. What a wonderful feature today! Loi is new to me so I will hop over to his blog. I love how he carved some storage and reading space into his older home that is multi-functional and beautiful at the same time! What a gorgeous space. Love those little unique sconces on the bookshelf wall. They are really unique and different. Beautiful space. What a beautiful home! Beautifully styled. Loi's library is perfection. I like that he can repurpose it for entertaining. His style is impeccable! 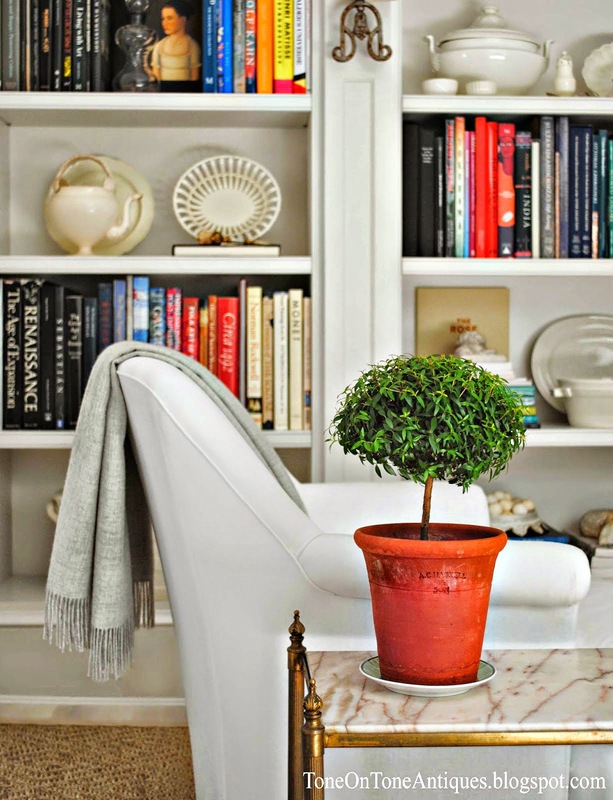 I'm adding his book shelf style to my Pinterest board. No question I'm going to study his style to tweak our shelves. Thanks for inviting Loi to share him favorite room. Loi is one of my favorite blogging friends. He is always so kind and engaging. This is a wonderful series, Kim! I love this series cause I get to meet a new blogger almost every week! Love the library, wish I had a room to do just this! Now I will go explore Tone on Tone! Loi is one of my favorite bloggers, and I love, love, love his aesthetic! Thanks Kim and Loi for this glimpse into your life. Oh Loi, I don't think I've ever seen your fantastic library! You never fail to surprise me! Such excellent taste and such beautiful spaces! Love it! Great feature today Kim and beautiful space Loi! Really gives me some ideas for Christmas, love the all white!! So pretty! Loi, your elegant simplicity is so refreshing! I appreciate that you accessorize and style your beautiful home in a unique way and not with trendy items that everyone uses. I could relax with a good book in that amazing library! Kim, what a perfect person to feature! I adore Loi's impeccable style, and he is such a nice person, too. I can just see that room lit for the holidays, and the lovely gatherings there. If it were my space, I would have my coffee there every morning. Everything Loi touches turns to beauty. What perfect timing to read your wonderful post, Lori. We moved a month ago into a house with a small room entered by the front door. Because there is a much larger space in the rear with less space/traffic issues from multiple doors, the first one is going to become a library too, so this post will be a wonderful resource as we finish and furnish it. Thanks for sharing! What a gorgeous room. Loi is just so darn talented...understated elegance. 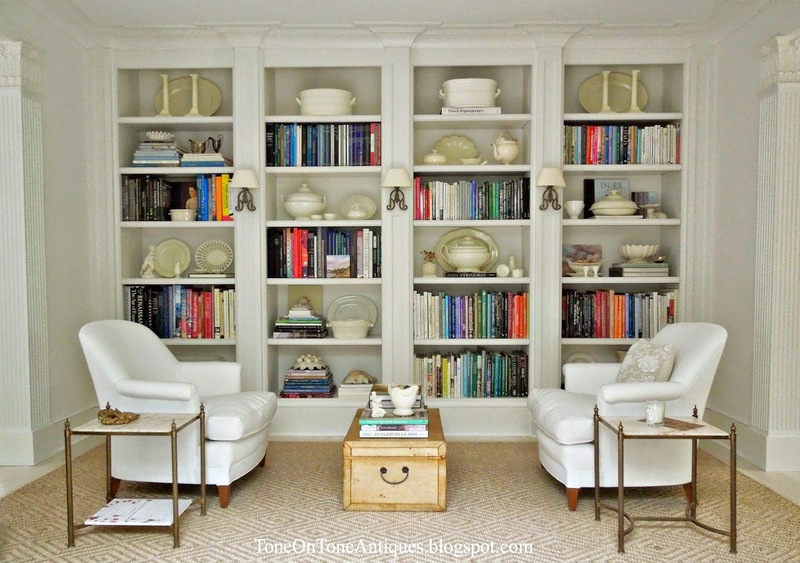 Love the creamware mixed on the shelves. Have to pin this!!! I love your library Loi! Your home and gardens are so beautiful. What a gorgeous library Loi, and I would hang out in there every season! :) Love the rug too! Wow! The library is amazing! I love the idea of serving drinks and hors d'oeuvres there! Fabulous! Must check out more! I can't believe I missed this post, but now I see that it was when we were moving. Love Loi!! I could not pick a favorite room in his home, I love all of them.